Chequers didn’t make an appearance at Conservative Party Conference, but the Prime Minister is still trying to push it through Parliament. Clearly she hasn’t seen footage of our packed-out Save Brexit rallies in Bolton and Birmingham where thousands of people chanted “chuck Chequers”. So we made sure the PM took notice by placing our message in the middle of her set-piece conference interview in House Magazine. In return, protestors attempted to sabotage our event with Jacob Rees-Mogg MP and Wetherspoons CEO Tim Martin, but were quickly dispatched by “Mr Nice”. 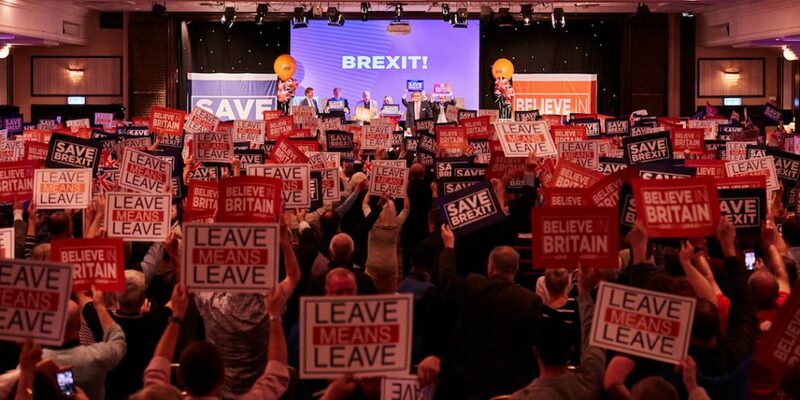 If you haven’t been able to attend any of our events so far, book your tickets and join leading Brexiteers in Torquay, Bournemouth, Gateshead and Harrogate. Can’t make any of our events? You can still help. Write to your MP, tell them how angry you are about May’s Chequers proposal: say you won’t vote for them again unless you get the Brexit you voted for. This is a campaign for the people by the people. 17.4 million of us voted for Brexit, so let’s work together to make it happen. Please forward this email to as many of your family and friends as possible, and share the below video on social media. Thank you for your continued support. Let’s keep pushing and ensure this Government chucks Chequers! Tagged Brexit, British Democrats, britishdemocrats.org, Leave Means Leave.